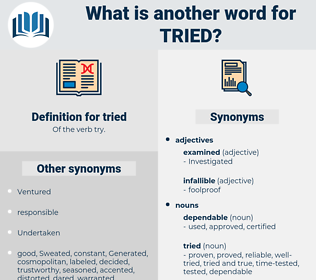 What is another word for tried? attempted, Adjudicated, tested, experienced, proven. Efforts, Strived, Strove, endeavour, endeavoured, agreement, treatment, sought, preferred, same, treated, treaty, only, Caught, Was, Were, Participated, Prosecuted, Searched, represented, collaborated, discovered, pursued, characterized, suggested, Endeavored, gathered, desired, Trafficked, Trafficking, us, Struggled, intended, GOTTA, Investigated, pointed, Carried, travelled, Wrote, concentrated, guysfelt, Insisted, proposed, Explored, considered, want, wanted, objective, stressed, Wished, found, highlighted, liked, Encountered, Ourselves, Persisted, threatened, perceived, employees, Arrived, classified, Fought, requested, Rated, Worked, mister, sir, identified, Resulted, Resorted, committed, Undertook, Appeared, reflected, maintained, monsieur, Followed, Promoted, HIT, agreed, Indicated, target, Targeted, emphasized, Operated, judgment, Threw, opted, excuse, Believed, conducted, drove, realized, continued, aim, Aimed, recognized, addressed, initiated, sustained, Wanna, GONNA, tired, reasoned, Managed, Wore, underlined, constituted, Tempted, Embarked, bid, chased, Hoped, checked, Performed, Proceeded, Broadened, ordered, welcomed, assisted, decided, dreamed, concluded, Succeeded, Responded, used, employed, Swore, dabbled, concerned, Deployed, Consisted, Told, watch, Watched, engaged, fancy, Tasted, Offered, CAILED, goal, touched, attended, Served, left, Flew, Reached, Asked, covered, Examined, Discussed, staged, judges, Judged, Tended, moved, assumed, ruled, Mentioned, extended, decreed, thought, Inquired, Cited, Killed, cost, held, Fled, Regarded, Brought, Helped, attached, Knocked, effected, tent, Deemed, turned, Filed, Delivered, played, felt, expanded, noted, Dealt, Picked, failed, expressed, heard, Gained, sent, noticed, formed, Questioned, Ranged, Answered, Commenced, put, Talked, Widened, studied, built, lf, involved, task, packed, Assessed, said, Voted, Came, guys, Began, started, earned, Bought, phoned, Caused, tied, focused, focussed, spent, drew, Viewed, Acted, accused, raised, Launched, locked, Sucked, posed, Claimed, landed, cooked, smoked, Ran, called, figured, baked, Gave, handled, Accounted, fell, look, Looked, me, pulled, Had, saw, kept, Got, Meant, stated, 'd, Went, Took, dated, Did, 'il, mr, named, made, experienced, trial. retried, Efforts, Striven, Strived, endeavour, endeavoured, sought, trialled, trialed, pre-tested, treated, treaty, triedto, characterised, Caught, Participated, Prosecuted, examinations, Furthered, trusted, interpreted, persecuted, interrogated, pursued, characterized, suggested, appreciated, Endeavored, desired, Trafficked, Trafficking, Struggled, Transferred, incorporated, criminalized, intended, presented, Administered, benchmarked, Investigated, consolidated, interviewed, removed, bothered, Exerted, Translated, trained, pointed, reported, consummated, Carried, demonstrated, Justiciable, ascertained, mediated, understood, evaluated, Insisted, proposed, Explored, considered, wanted, process, stressed, Criticised, Contended, measured, Wished, found, highlighted, liked, Encountered, Ourselves, recommended, designated, request, perceived, Remitted, Fought, resolved, requested, Rated, Worked, Entered, identified, Sentenced, nominated, Resulted, implemented, pressed, Undertaken, settled, Resorted, supposed, committed, Obtained, Adjudged, Appeared, reflected, strained, maintained, accepted, selected, Tackled, Followed, Promoted, Instituted, Convened, Introduced, agreed, elaborated, described, Indicated, afflicted, received, Targeted, Exercised, emphasized, Appraised, Contributed, judgment, enlightened, shot, experience, opted, convicted, Believed, conducted, surrendered, depleted, continued, destined, Aimed, recognized, chosen, dedicated, completed, addressed, initiated, sustained, Rehearsed, Pushed, evidenced, Withstood, Argued, Assayed, Indicted, Approached, allocated, Achieved, Inspected, worn, adopted, credited, Manifested, murdered, approved, deferred, exhausted, instructed, imposed, Managed, Infringed, pronounced, applied, researched, Termed, Visited, accomplished, Rendered, proceedings, Tempted, Embarked, chased, Hoped, set, Suffered, Enacted, checked, devoted, Performed, Referred, Submitted, estimated, loved, combusted, Challenged, dismissed, analysed, ordered, welcomed, directed, reviewed, decided, concluded, Screened, Enjoyed, utilized, Succeeded, attested, Strapped, ensured, alleged, used, employed, elected, concerned, Deployed, enquired, merged, Debated, engaged, consumed, Tasted, educated, satisfied, Issued, Cared, Returned, Surveyed, touched, attended, Endured, ranked, pledged, Undergone, Asked, Incurred, witnessed, covered, Examined, Discussed, enforced, Piloted, promised, Subjected, Judged, Tended, forced, declared, disposed, moved, campaigned, mandated, assigned, Summoned, assumed, charged, tabled, paid, Accorded, Upheld, ruled, sampled, thought, produced, hired, Seemed, Killed, held, Regarded, Brought, attached, combined, Passed, Deemed, turned, seized, Filed, discharged, Delivered, felt, noted, Been, Dealt, eaten, dictated, Picked, Demanded, expressed, heard, Gained, village, sent, inclined, divided, Questioned, condemned, Answered, stoned, seat, laid, put, obliged, Expelled, Gauged, studied, involved, Allowed, punished, abused, Assessed, wired, Begun, said, dropped, Borne, Voted, Denounced, Shown, doomed, started, drawn, risen, Caused, fired, tied, placed, Flagged, faced, focused, spent, headed, Viewed, fulfilled, Acted, accused, raised, Launched, designed, posed, Claimed, seen, Polled, led, run, smoked, bound, called, given, handled, Met, Looked, taken, Drank, drunk, have, Had, Has, gone, kept, Gotten, Got, Meant, based, stated, done, Adjudicated, named, made, tested, experienced, proven. fickle, hazardous, uncertain, untruthful, traitorous, deceitful, untrustworthy, unproved, unsafe, debatable, questionable, recreant, dodgy, doubtful, perfidious, unfaithful, faithless, disputable, inconstant, unproven, mendacious, unsound, shady, unconfirmed, suspect, dubious, false, undependable, Doubtable, disloyal, untried, risky, problematic, dishonest, untrue, treacherous, fishy, lying, shaky. He came back to himself, and tried to think it out, but could not. He tried to get work but he couldn't.